Zenalux is a biomedical diagnostics start-up in Research Triangle Park, NC. The company has established its leadership in biophotonics through its deep ties to Duke University, and features a highly qualified management team with proven executive experience. 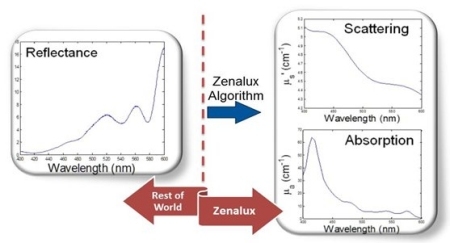 Zenalux’s goal is to make optical spectroscopy easy for medical practitioners who are interested in real-time, non-destructive biological tissue diagnostics. Our products provide effortless translation of uv-vis tissue spectra into quantified biological endpoints to enable the medical professional to focus on medical applications of the technology. The company’s flagship product, Zenascope™, is a patent-protected, photonic system that quickly and non-destructively measures important biological endpoints including hemoglobin concentration, hemoglobin saturation and scattering (a measure of cell density and necrosis); however the system can easily be tuned to include additional absorbers of interest. Current customers use the system primarily to monitor response to therapy and also to discriminate between benign and malignant tissue. This unique product enables improved diagnosis, better treatment and ultimately cost reduction in the health care system. Application areas include accelerating feedback in drug discovery; head and neck cancer detection, response to therapy, breast tumor margin assessment, and cervical cancer detection.